Child, will you come on down? Balloons and war. They don't seem to go together, do they? But we balloons have a long history as warriors. Some were fighters, like the German zeppelins of World War I or the Japanese fu go, and some were spies, like the Intrepid who served the Union during the American Civil War. My compatriots and I-- we were the guardians of London during World War II. They called us barrage balloons. 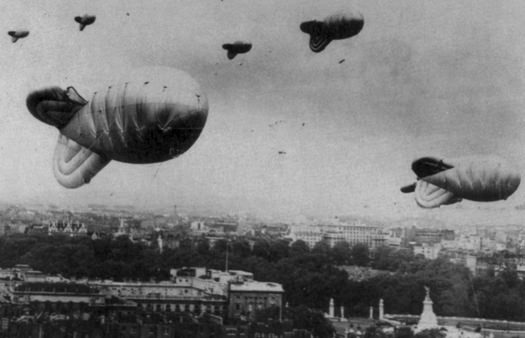 There were other barrage balloons elsewhere in England, some in the United States, and even some in other countries, but we were the London balloons. We flew over the city, tethered on long steel cables, to protect it from the enemy trying to bomb it. By that time, they didn't use zeppelins to bomb anymore; instead, their pilots flew fighter planes over the city and dive bombed it with those. We helped stop some of those pilots by forcing them to fly high in the sky, where anti-aircraft guns could shoot them down. If the pilots tried to fly below us, our strong cables would clip their planes' wings. We weren't exceptionally effective, but we did our best, and we did stop some of the dive bombers. My compatriots were brave and proud to perform their duty, proud to fly all plump and round, and proud to meet death if they tangled with a plane or a bomb and were damaged beyond repair. Me, I never felt worthy of flying among them, because I was not proud of my service. I hated it. I was not ashamed of it; I was not even afraid of the planes or the bombs or of dying. I simply hated being part of the balloon barrage. We frightened many of the children, even though most of them loved the normal balloons-- cheerful hot air balloons, sweet and colorful little party balloons. So to make them less afraid, some adults wrote books for them about heroic barrage balloons, what their everyday lives were like, and what they did to protect the Allies. 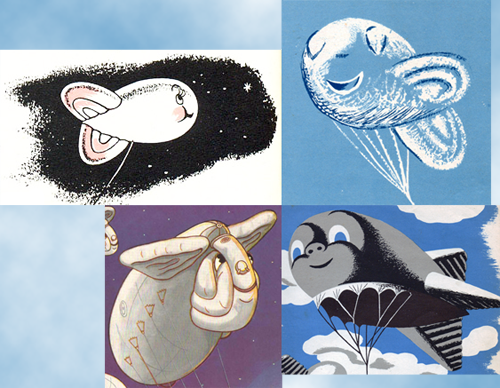 The books had illustrations of cute, charming barrage balloons who didn't look scary at all, and all those balloons had cute, charming names: Blossom and Bulgy, Boo-Boo and Bobo. But all the same, the children of London looked up at us real barrage balloons with frightened eyes, because we weren't cute and charming like the balloons in the books. Instead, we must have looked like sky-monsters to the children, floating around up there and casting lumpy black shadows on the streets. When one of us was shot down, he or she looked like the saggy pelt of a giant skinned animal, and when a barrage balloon broke loose from his or her tether, the soldiers made such a ruckus chasing down the escapee, we must have seemed very dangerous indeed. We were dangerous-- not to the children, of course, but to anyone who got too close to our cables. They destroyed enemy and friendly planes alike, and that was another reason I hated what I was. Perhaps if I could have been sure I would scare and hurt no one but the enemy, I would have felt differently. But as things were, I cringed and pulled on my cable every time I heard a plane coming near, and I trembled when the dive bombers dropped their deadly loads anywhere near me. I even tried to pull my cable loose from its winch a few times, hoping I could escape my tether and fly away. I never managed to do it. And then I was killed. My death came while I was on duty, but not during a battle and not at the wings of an enemy plane-- or any plane at all. Instead, lightning struck me during a thunderstorm. The lightning itself did not kill me, but I caught fire and burned there in the sky. That never happened to Blossom or Bulgy or Boo-Boo or Bobo, and if any children were looking out at the storm and saw me slowly descending in flames, I'm sure they were terrified. It was all over for me quickly, though, and my last thought was that I'd gotten what I deserved, for hating my duty as a barrage balloon. I lay on fresh green grass, deflated but not burnt and in no pain. A very small, very purple hot air balloon hovered over me, and he squeaked cheerfully when he saw I was conscious. He said that he was a kind of balloon called a "Drifblim," and I had come to the place where some balloons go when they die: Serannian, an island in the dream world which floats up in the air where the sea meets the sky. I snarled at him to let me stay dead. The Drifblim and his balloon friends were kind and patient with me, and I eventually adjusted to living again, and to living in Serannian. Now I am one of several balloons who guard the island from invaders-- a duty very like my old service in some ways, but very different in others. I find it much more agreeable, for no one in Serannian fears me, and there is no chance of me accidentally injuring a friend. Yet I still relive London and the war. Some nights while I'm asleep, tethered along the harbor where ships enter after sailing up from the ocean below, I have terrible nightmares. I often awake thinking I am back in London, and Kyzer, who usually guards the harbor with me, has to reassure and comfort me. At times, the nightmares even come while I am awake, and I cringe and tremble there in Paradise, believing I am back in Hell. When I wake up screaming about lightning, Kyzer and the Drifblim try to soothe me by reminding me that no storms ever gather above Serannian. No storms, no planes, no bombs. They don't understand that I already know these things, logically. They don't understand that logic won't make the nightmares and the visions go away.